XJTAG visited Indra in Spain to demonstrate boundary scan testing for high-value avionic boards. Presented with a batch of failed units that had defeated previous attempts at diagnosis, XJTAG quickly tracked down every fault, enabling the boards to be repaired. Indra now uses XJTAG in several development and production departments. 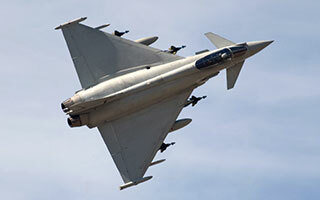 Indra invited XJTAG to show how boundary scan could enhance test and diagnostic capabilities for Eurofighter avionics boards produced at the company’s factories near Madrid. The high-value circuit boards are built on a metal-alloy substrate for reliable operation over a wide temperature range. The nature of the substrate, however, challenges assembly processes such as soldering. Functional tests had proved capable of identifying defective boards. However, once isolated from the production process, these boards had resisted engineers’ efforts to diagnose and remedy the faults. Upon arrival, XJTAG’s engineers were invited to test five undiagnosed boards to demonstrate the system’s abilities. The team quickly traced the first board’s fault to an open circuit between two pins. Indra engineers then examined the connections using a microscope, discovering a tiny break in one solder joint that confirmed XJTAG’s diagnosis. After repair, the board successfully passed the functional test routine it had previously failed. The XJTAG team also diagnosed the remaining boards in the failed batch, quickly pinpointing defects including hard-to-find faults underneath BGA devices. Since each board is worth around €10,000, this short yet productive visit highlighted the value of boundary scan to Indra’s work on Eurofighter as well as other projects. Indra has now invested in several XJTAG licenses and uses the XJTAG Professional development system, XJAnalyser and XJRunner, which is optimised for production-line use by OEMs or contract manufacturers. “With the help of XJTAG’s engineers, as well as access to the API and hardware devices such as XJLink2 and the XJIO expansion boards, we have also integrated boundary scan with some of our in-circuit and functional test platforms to enhance test coverage and efficiency”, comments Joaquín Martínez Bonilla, Project Manager at Indra. Sergio Navacerrada Castaño adds, “The XJTAG system has impressed us from the first encounter. We are now using it with most of our projects, from development through to production”. XJTAG showed that boundary scan could help us overcome the challenges we face when assembling advanced, high-performance electronics. It is feature rich, easy to use, and the price is very competitive versus other systems, with no additional charges for using advanced features. XJTAG has impressed us from the first encounter. We are now using it with most of our projects, from development work through to production. Indra is a €3 billion technology multinational, headquartered in Spain and active globally in sectors such as transportation, energy and industry, healthcare, telecommunications and defence. Seeing innovation as central to differentiating its solutions and adding value for customers, Indra has a network of centres of excellence specialising in specific technologies and expertise. The company is also adept at leveraging talent in other organisations, such as partners that are leaders in their own fields, to keep driving the pace of progress.